For years, the world of high fashion has ignored, flirted with and appropriated hip-hop. Finally, the style is as cool on the runway as it is on the street. Hip-hop has always had a way of asserting its domain — it shows up, it makes a scene, it seduces and cajoles, it is embraced, it takes over. Which makes it all the more vexing that, for decades, men’s fashion managed to resist its charms. I don’t mean style — hip-hop has always had signature style, defining looks that changed practically every year. But the higher end of men’s fashion long kept its nose in the air, old money letting new money know exactly where it wasn’t welcome. Since the days when Dapper Dan was cooking up flamboyant luxury knockoffs out of a Harlem storefront, hip-hop had its sights set on infiltration, and it’s finally making headway as an influence on the runway. But the silk ceiling was real, and so hip-hop made do, writing its own fashion codes, doing what it could with what was around. Long before I started writing the Critical Shopper column for The New York Times — five years and counting, now — I was a critical shopper on the outer edge of Brooklyn, sniffing around Kings Plaza for new Girbauds, shopping for Carhartt on Avenue U. Before there were stores that specifically catered to hip-hop taste, you pieced together your outfit as best you could. Some days in the 11th grade, I’m sure I wore a motorcycle jacket with saggy jeans and Jordan Vs — I looked ridiculous, I imagine, but 16-year-old me would have been glad to know that a couple of decades later, that would turn out to be a dominant hip-hop look for a few months. Back then, hip-hop style was an imperfect art, and looking right took work. Eventually, though, in the early- and mid-1990s, rappers started colonizing mainstream brands — Raekwon wore the brashest Polo, Grand Puba made Tommy Hilfiger swing. That was the first era where men’s clothing designers began to respect the hip-hop dollar. On lucky days, I’d come into Manhattan and get lost in the Polo or Hilfiger section of Bloomingdale’s, wondering how loudly I could let a logo scream off my body. Very loudly, as it happened, and hugely, too. As men’s high fashion was becoming emaciated, hip-hop was asserting its own silhouette — baggy, slouchy, indifferent, with a tenuous relationship between the clothes and the body hidden beneath. (I’m bigger now than I was in high school, but my old Carhartt jacket is still two to three sizes too large.) What may have begun as a reflection of mainstream white stiffness ended up becoming a stand-alone aesthetic. No one told us what we were doing was fashion, and for the most part, we didn’t care, content to be on the outside and in control. And for a while, hip-hop didn’t ask much of high fashion. Left out in the cold, it created its own style heroes — Karl Kani, Maurice Malone. Eventually, rap stars, sensing a swelling marketplace at the peak of their mainstream selling potential, began clothing lines of their own. But somewhere in that deluge of Sean John and Rocawear, aspiration went missing. In bringing everyone to its table, and becoming pop lingua franca, hip-hop took its eye off the fashion prize. What was once available only to a select few was suddenly the stuff of mass production. It would take a next wave of dissenters to set a new course, artists who implicitly rejected hip-hop at its most centrist, and who sought to remake it sonically and aesthetically. Skip past the era where Jay Z began wearing button-up shirts — untucked, of course — as a nouveau riche gesture. Those were dark days. Others, though, had more ambition. There was Pharrell Williams, hip-hop’s original hipster, who began as a trucker-hat revivalist and ended up as one of the world’s most vivid dressers, a widely embraced icon of casual luxury. There was the Harlem fabulist Cam’ron, with pink fur matching his pink Range Rover, adding a dash of flamboyance. And there was the dandy-in-training André 3000, who for a time seemed like the likeliest candidate to bridge hip-hop and high fashion with his vintage-prep line Benjamin Bixby. But a few years ago, I spotted a glut of it during a Barneys Warehouse Sale; the next year, the same glut. And of course, there’s Kanye West, the pinnacle of hip-hop’s high fashion dreams. No one in the genre has acted more boldly, taken more risks, more assiduously pushed the boundaries of what might constitute hip-hop fashion. He was the first to go and knock on high fashion’s door. In 2009, he attended the Paris men’s shows with a full crew, all dressed in outfits that were dapper and fluorescent. 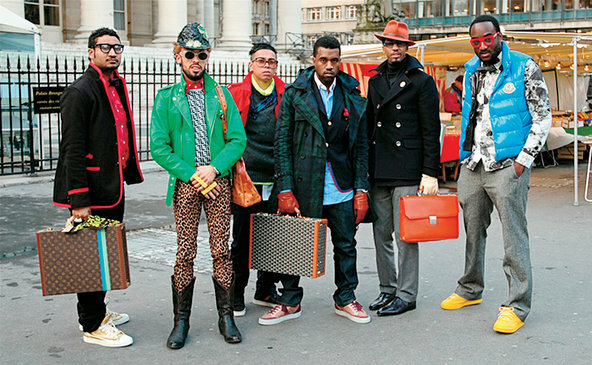 This was at the beginning of the street-style era, and photos of them sped across the Internet, eventually resulting in a “South Park” parody. But as is often the case, Kanye was just early-adopting something that would become commonplace. Within a couple of years, the front row became lousy with rappers. And increasingly, the clothes they were seeing bore faint traces of hip-hop’s aesthetic. In the mid-2000s, the genre’s kinetic physicality was echoed in Yohji Yamamoto’s billowy shapes, with pant legs that draped and gathered. And it’s hard to think Raf Simons wasn’t a little influenced by hip-hop when putting on runway shows that featured puffy hooded jackets paired with baggy trousers, or bomber jackets festooned with logos, commentaries on the sort of capitalist excess that hip-hop has always been extremely comfortable with. Not surprisingly, hip-hop had made its way into women’s fashion long before molasses-slow men’s wear took note. In 1991, Karl Lagerfeld filled his runway with gold chains, slouchy leather, ball caps and denim, updating the B-girl for Madison Avenue. And in the late 1990s, David LaChapelle turned Lil’ Kim into a living, breathing Louis Vuitton satchel by covering her naked body with its logo. It was an unpredictable shift, but an authentic one. Street style brought fashion to a wider audience, making new stars from new runways. At the same time, hip-hop fashion was turning upscale, with premium lines like A Bathing Ape and expensive retro sneakers becoming the new objects of desire. On Tumblr, especially, these worlds came together and helped create a hip-hop high-fashion taste profile. And when hordes of young guys — young straight guys, for the most part — began to puff out their chests and talk about clothes, they by and large used the language of hip-hop. No surprise there. Hip-hop is a culture that’s peacockish by nature, that has always rewarded those who went out of their way to look flawless. It is also a predominantly heteronormative space — too much so, at that. 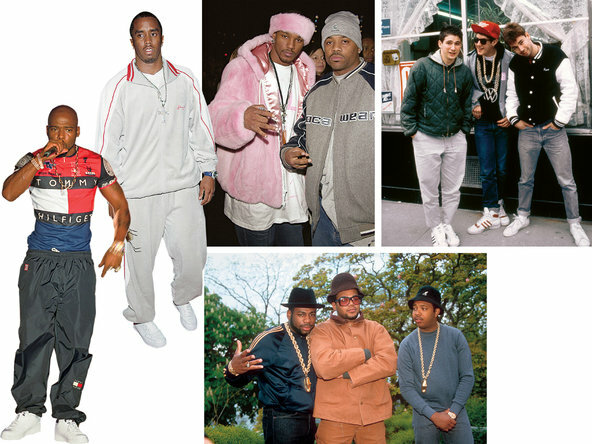 But for a new generation of style adherents looking to create a new grammar of fashionability — advanced style for bros — using hip-hop as a reference point helped smooth the process, giving it a familiar framework. That way, when the clothes get weirder, as ASAP Rocky has rapped, no one feels uncomfortable. Least of all Rocky himself, who has managed to become one of the first rappers besides Kanye to be embraced by high fashion. He is a maverick, whether wearing architecturally precarious Raf boots on Letterman, a moto jacket and tattered denim or a crop-top sweater on the cover of the French fashion magazine Jalouse. Hip-hop’s grammar has grown so vast that someone like Rocky isn’t the outlier he might have been a decade ago. And Rocky is the endpoint of a decade of fashion’s belated embrace of hip-hop — not a work in progress, but a fully-formed natural, equally at home in the front row and on the street corner. With every passing season, the gap between hip-hop and fashion shrinks just a bit more. And as high fashion has increasingly become high-end street wear, with traditional tailoring an afterthought (see: athleisure, and any number of other unbearable portmanteaus), the takeover is all but complete. And the DNA is pure hip-hop. It’s there in the exaggerated logos of Hood by Air and Nasir Mazhar, designers who are inverting the traditional direction of diffusion, moving from the street upward. It’s there in John Elliott + Co’s saggy, skinny sweatpants and denim, compromises between the apathy of then and the sleekness of now. It’s even in precious Céline, where Phoebe Philo is making knockoff Nike Air Force 1s, acknowledging that shoe’s foundational elegance at around eight times the price. As always, there are detractors, people who wish hip-hop would keep its distance and leave well enough alone. But for anyone in the fashion world who feels frustrated with the current state of affairs, just cool your jets and wait: The art world is next.